Giving change to people on the street is on it’s way out and a tech group in Halifax is trying to provide an alternative. As part of the Blockchain Virtual Govhack, a worldwide competition that helps build smarter cities, a tech company called BlockCrushr Labs is developing a project called Hypergive. Burke identified two issues in panhandling he thought could be solved with modern technology. First, people are less likely to give money to someone in the street as they usually only carry debit or credit cards. A survey released by Moneris in 2016 predicts that 70 per cent of Canada will be cashless by 2030. A cashless society greatly diminishes the chances to give money to people on the street. Second, even when people have cash on them, Burke says there is a lot of cynicism about where the money eventually gets spent. 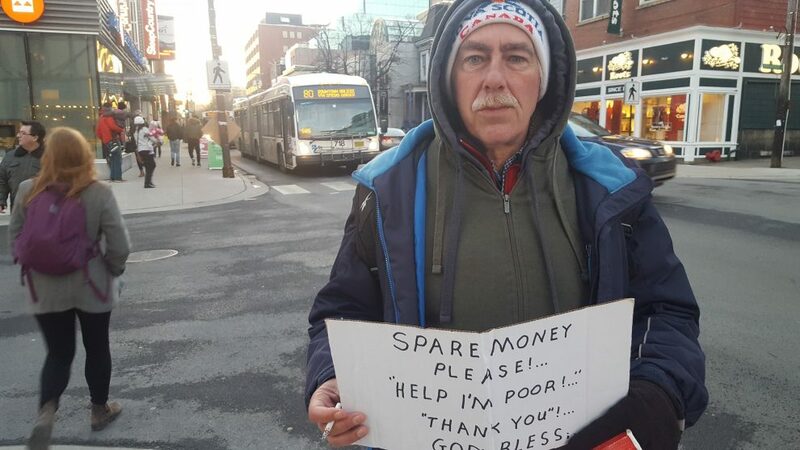 He says he has spoken to a lot of people that are reluctant to give money to people on the street in fear that it will be used to buy alcohol or drugs. Hypergive will be an app where someone can give money to the homeless people they cross on the street. That money will then be transferred to an account accessible to the homeless person through a smart card. That card will allow them to use the money at certain retailers for food or health products. Hypergive isn’t available yet as it is still in development. This project is made possible by a new technology called blockchain. This technology is the same one used by cryptocurrencies, such as Bitcoins, and is being presented by many economists and programmers as the way of the future. Cryptocurrency is a way to securely and openly make transactions with others and records all of that in every block of the chain. “Blockchain is an underlying protocol that defines a way that parties may communicate in an open, transparent, distributed form of consensus,” says Andrew Redden, another founder of BlockCrushr Labs. Every party is represented as a block and all transactions between those blocks are transmitted to all the other blocks. That ensures that all the transactions follow a certain set of rules and guarantees transparency. “Blockchains are a method to assure trust in information in a decentralized fashion,” says Burke. Using that technology, Hypergive would allow anyone to give money via an app or website and it makes sure that the money can only be spent according to the rules set. This app would allow everyone to keep the immediacy of giving change on the street with the same benefits as giving a gift card. In order for the recipient of the donations to use the transfer, they must comply to the protocol set in the blockchain. That ensures transparency and that the money will be used for food or basic needs. That protocol is set by the local community centre or government. BlockCrushr Labs say they don’t plan on micromanaging the implementation of the app. However, Mogl-MacLean says he is concerned that Hypergive is playing into a harmful narrative about homelessness. “The issues that people on the streets are fighting are so much more complex than the idea that they don’t want it to go towards alcohol or drugs,” says Mogl-MacLean. BlockCrushr Labs say they are not pretending to know the intricacies of being homeless. The app is a tool that will be available to any community that wants to use it. “We are trying to provide communities with tools and say ‘hey, maybe this can help,’” says Burke.